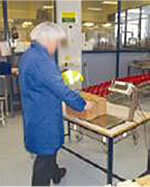 Boxes weigh 3.5 kg and each must be picked up and placed onto the balance. A box is handled every minute. The balance has been sunk into the workbench to allow for the boxes to be slid on to and off the balance without being lifted. 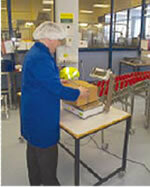 Using a mechanical lift for the foil rolls eliminates the requirements to manually lift the rolls onto the spindle.